"Why Is It Important to Society to Safekeep the Covenant of Marriage?" "Why Is It Important to Society to Safekeep the Covenant of Marriage Between A Man and A Woman?" You might think that divorce is a modern phenomenon and that the Catholic Church has not yet caught up with modern practice, but Jesus Christ responded to the practice of divorce in Jewish society 2000 years ago. He was confronted by the religious leaders of the day, who knew divorce was wrong, though made legal in the Jewish and Roman societies. When asked if divorce was okay, our Lord responded: “Have you not read that the one who made them at the beginning ‘made them male and female,’ and said, ‘For this reason a man shall leave his father and mother and be joined to his wife, and the two shall become one flesh’? So they are no longer two, but one flesh. Therefore what God has joined together, let no one separate” (Mt 19:4b–6). Jesus brought the discussion back to the origin of God’s creation of man and woman. God designed men and women for marriage, to be one flesh in sexual cooperation to bring about the wonder of children and the mutual self-giving of the spouses to each other for the entirety of their earthly lives together. You might say that Jesus was only teaching Christians—and that the Church’s consistent teaching through the centuries on the indissolubility of marriage is only for Christians—but this is not true. Jesus, in citing God’s creation of men and women, applied this teaching to all of humanity, regardless of religion or nationality. The Church presumes, therefore, that all “first time for both” marriages—including the marriages of Catholics, other Christians, Jews, Muslims, Hindus, etc—create a covenant for the husband and wife’s entire life. Therefore, if you were married, chances are you are bound by a covenant of marriage with that person. Marriage is an Indissoluble Covenant God’s teaching holds that marriage is a covenant that cannot be revoked or ended by human decision or human law. This is what we mean by marriage being indissoluble. When a man and woman enter marriage for the first time, the bond of marriage is presumed to endure until the death of one of the parties; but this presumption can be overturned, as will soon be explained. The Vows Bring about a Marriage Establishing a covenant of marriage is relatively simple—a man and woman who are not already in a marriage covenant need only to exchange their consent (i.e., the wedding vows) publicly before witnesses. 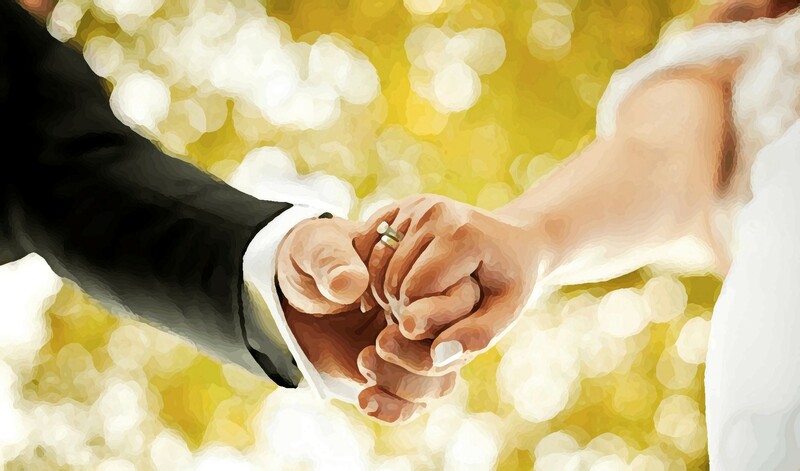 “The marriage consent is an act of the will which signifies and involves a mutual giving which unites the spouses between themselves and at the same time binds them to the children which they may eventually have, with whom they constitute one family, one single home, a ‘domestic Church’” (Blessed John Paul II, “Consent Makes Marriage, Its Defense by the Church,” 28 January 1982, no. 4, quoted in William H. Woestman (ed. ), Papal Allocutions to the Roman Rota: 1939–1994 (Ottawa: Faculty of Canon Law, Saint Paul University, 1994), p. 172). There are, of course, several requirements to wed, such as proper age and not being forced into marriage, but the basic requirement is the exchanging of the wedding vows. With Catholics, however, there is one other essential requirement: the couple must express their vows before a priest or deacon of the Catholic Church. Married “Outside the Church” You’ve heard it said, “I married outside the Church.” This means that a Catholic did not marry in front of a priest or deacon and two witnesses. The union may be recognized by the State government or even by a non-Catholic denomination or different religion, but it is not recognized as a marriage covenant by the Church. If the man and woman are in such a union, they may correct what was previously missing and exchange their consent before a priest or deacon and two witnesses. This is called a convalidation ceremony, which is in every way the wedding ceremony that all Catholics experience. However, if one or the other is in a marriage covenant, then he or she will need to be freed from that marriage covenant before being able to celebrate a marriage recognized by the Church through the convalidation ceremony. Marriage, Separation, and Divorce … and Remarriage For someone in a marriage covenant who has separated and has obtained a civil divorce, there is no serious offense with their situation provided they live a life of chastity, respecting the covenant of marriage. For the divorced Catholic, this means he or she can continue in the practice of their Catholic faith by reception of the sacraments (except marriage), by taking on certain parish-based ministries, etc. However, someone in a marriage covenant who has separated, obtained a civil divorce, and has entered a new union (i.e., civil marriage) or is not living chastely is violating the covenant of his or her first marriage. This way of life is at odds with God’s design for him or her, and for the covenant of marriage. For Catholics in the new union, this means they must refrain from receiving the sacraments. I am “Remarried” without an Annulment — What Do I Do? If the covenant of marriage is presumed to exist, the most common way to realize another marriage in the Church is to challenge the validity of the prior marriage or cite where and how divine law permits a prior bond of marriage to be dissolved. Only after it is declared that a prior marriage was invalidly established, or can be dissolved, can a person validly attempt to enter a new marriage. Challenging the Validity of the First Marriage Covenant Formal Annulment. Since consent (i.e., the wedding vows) brings the marriage into existence, and consent is a human act, you can always make the claim that the consent that was given was defective—that there was a problem when either (or both) people approached the marriage. It can be argued that one or both parties (1) did not intend what must be intended regarding marriage (e.g., left no openness to children), or (2) did not understand the nature of marriage (e.g., honestly thought it was dissoluble), or (3) did not have the capacity to take on what was required of them in marriage (e.g., made the decision recklessly, without due regard for what would be required of them). These cases take about 12–18 months to complete. Pauline Privilege. If you and your former spouse were non-baptized people at the time of your wedding and at any time after the wedding you became baptized, you can seek the Pauline Privilege (cf. St. Paul’s 1 Cor 7:10–15) provided that your former spouse does not want baptism and that he or she does not want to restore common life and live peacefully with you. To seek this, you must want a new marriage since at the moment of the exchange of consent your first bond of marriage is dissolved. This process takes only one or two months to complete. Who Needs to be Freed from a Covenant of Marriage? Any person bound by a covenant of marriage who is in a second union or wants a second union needs to challenge the validity or seek a dissolution through the Pauline Privilege, Petrine Privilege, or Non-Consummation case. This applies, of course, to Catholics, but also to everyone else since Christ’s teaching is clear: “Therefore what God has joined together, let no one separate” (Mt 19:6b). Whenever a non-Catholic who is in a covenant of marriage wants to marry a Catholic who is free to marry, the non-Catholic first must be freed from his or her covenant of marriage. Once Free to Marry After the Church determines the presumed covenant of marriage is not valid, or that the bond of marriage can be dissolved through Pauline Privilege, Petrine Privilege, or Non-Consummation, then a “new” marriage can be celebrated in and recognized by the Church. The Church Understands and Cares The clergy and the laity who assist the clergy know that the times in which we live are hostile and ignorant toward the God-given and wonderful covenant of marriage. Most dioceses appropriate significant financial resources to operate marriage tribunals to help people be faithful to Christ’s teaching, and which may provide the possibility of being freed from a marriage covenant to realize a “new” marriage in the Church. The teaching of Christ, “Therefore what God has joined together, let no one separate,” is not an easy one to understand and follow—but pray to your heavenly Father that, on this path that might seem daunting and even impossible, you will have the grace to understand and the courage to follow. Christ’s Church will walk with you. Mr. Michael Trueman, M.Div., J.C.L., currently serves as Chancellor of the Archdiocese of Detroit and adjunct part-time faculty for Sacred Heart Major Seminary, Detroit. He is the co-author of two question and answer books on church law (Surprised by Canon Law, Volumes 1 and 2,Servant Books, 2004, 2007).